Top chefs and hospitality industry figures are shaping up for a charity boxing night later this year – and this time they will be stepping into the ring rather than the kitchen. 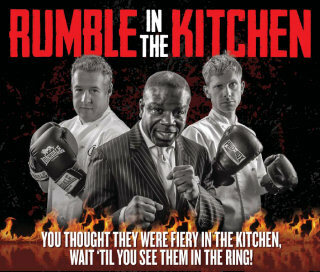 Rumble in the Kitchen is a white-collar boxing match – with saucepans! Celebrities from the world of hospitality have decided to lay down their whisks and corkscrews to step into the ring to battle it out, including Marcus Wareing and Monica Galleti and Sommelier Fred Siriex. The battle will continue in the kitchen with the food court provided by Brett Graham (The Ledbury), Chris and Jeff Galvin (Galvin at Windows), Daniel Boulud (Bar Boulud), Michel Roux Jr (Le Gavroche), Philip Corrick (The Royal Automobile Club) and Raymond Blanc (Le Manoir). Rumble in the Kitchen is expected to attract 300 guests and will be held at the Royal Automobile Club on 20th September 2012. The special one-off event is being staged in aid of Galvin’s Chance, a charity project aimed at giving young people at risk the opportunity to train and work front of house in some of London’s finest restaurants and hotels. Book your ticket quickly as places are limited, via galvinschance.co.uk. Arts, antique and design buffs attending the Masterpiece London fair from June 28 – July 04 can also indulge in some fine wine thanks to Domaine Clarence Dillon, which has announced that Clarence Dillon Wines will be present at on Stand D20. Fair visitors will have the chance to taste and purchase Clarendelle Rouge 2005, Rosé 2011, Blanc 2011 and Amberwine 2003 and will have a unique opportunity to purchase a limited number of exceptional vertical case collections of the Domaine’s most famous wines, Châteaux Haut-Brion and La Mission Haut-Brion including A six-bottle case of Haut-Brion 2009 (which scored the perfect 100/100 from Robert Parker) and a range of “extraordinary verticals,” of Haut-Brion and La Mission. 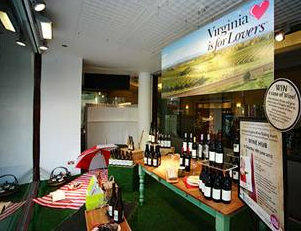 Shoppers on London’s Kensington High Street may have noticed a full window display at Whole Foods Market which is one facet of a summer-long UK marketing campaign for wines from the US State of Virginia. A relative newcomer to the international wine scene, the reputation for Virginia’s wines has been rising to such an extent that the State is now focusing much of its international marketing efforts around promoting wine tourism. There are in-store tutored tastings and a live, simultaneous Wine Tasting on 24 July that will hook up to Virginia via Skype video-conferencing. Tastings during June, July and August at Whole Foods Market in Kensington will feature award-winning wines. Regular readers of wine-pages will remember Tom’s report from Château La Coste in Provence, home to the most extraordinary collection of architecture and art installations amongst the vineyards. The estate, owned by Irish businessman Paddy McKillen, has just annouced a new building to add to the collection, to be designed by The Shard’s architect, Renzo Piano. Other projects by world renowned architects Frank Gehry, Richard Rogers and Sir Norman Foster are also in development at La Coste to join the dozen major works already on site, and a luxury hotel-spa designed by Tangram Architects is scheduled to open at the estate in 2013. 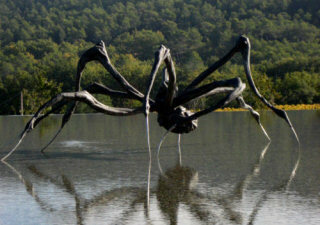 Photo: Crouching Spider 6695 by Louise Bourgeois.